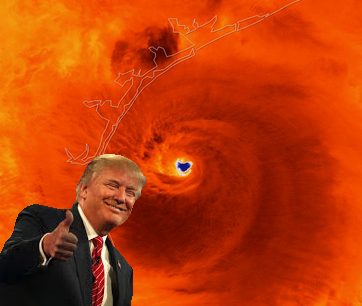 Hurricane Harvey is a clarion call to climate deniers like Donald Trump. Extreme weather is one of the hallmarks of a world ravaged by climate change. Severe storms and catastrophic flooding illustrate the dangers of global warming more graphically than any research ever could. Hurricane Harvey now ranks as the worst rainstorm in US history. The storm saw winds as strong as 132 mph and some of the largest downpours ever recorded. It should be noted that this extreme rainfall is clearly consistent with climate models. One of the cities hit hardest was Houston, where heavy downpours have increased 167 percent since the 1950s. The rainfall from Harvey is off the charts of the National Weather Service topping 50 inches in some spots. The result is catastrophic inland flooding. Calling this unprecedented is an understatement. In just three days, Houston more than doubled the previous record rainfall for a full month set in June 2001. As reported in Grist, Meteorologist Ryan Maue predicted that Harvey would unleash more than 20 trillion gallons of water on Texas. Texas is only one of many places suffering from catastrophic flooding. All around the globe heavy rainstorms are increasing in frequency and intensity. In India, Nepal and Bangladesh, recent monsoon flooding has killed 1,200 and millions have been forced from their homes. Although oceans are warming almost everywhere, the waters in the Gulf of Mexico are of particular interest because they are some of the hottest in the world. According to climate models these are ideal conditions for violent storms. In the wake of a disaster, presidents have two primary functions sympathy and inspiration. Trump failed on both counts. By not mentioning the victims of the flood Trump failed to show sympathy and rather than inspire he offered yet another round of shameless self-promotion. In a CNN article, David Axelrod described Trump's recent visit to Texas as, "another dispiriting display of obtuse self-puffery." Trump lauded his administration's efforts and he even had the audacity to mention crowd sizes while touring Corpus Christi saying, "what a crowd, what a turnout". He then boarded his helicopter leaving residents with the words, "good luck". Even if he wanted to Trump may not be capable of uniting the country after the Charlottesville tragedy. Presidents have historically brought Americans together in the wake of disasters. However, it is hard for Trump to redeem himself after he has so painfully divided Americans by inferring moral equivalency between white supremacists and anti-fascists. Trump has repeatedly denied the veracity of climate change so the fact that he wants to cut climate research should come as no surprise. Trump is trying to cut funding for agencies that protect Americans from climate impacts and he wants to silence those government organizations that study climate change. He is also trying to scale-back climate resiliency programs. Trump has yet to fill key leadership positions within his government including the head of the National Oceanic and Atmospheric Administration (NOAA), which oversees the National Weather Service. These are not coincidental omissions. Trump is trying to suppress climate science and storm related modeling in particular. Hurricane Harvey slammed into Texas just a few weeks after Trump proposed budget cuts to the National Weather Service and its parent agency NOAA, These cuts would make predicting, preparing and responding to storms more difficult. Trump wants to slash 6 percent from the Weather Service budget and 16 percent from NOAA. Trump's proposed budget would also cut 26 percent from NOAA’s Office of Oceanic and Atmospheric Research and 22 percent from the National Environmental Satellite, Data and Information Service. Trump appears to be determined to minimize the ability of government agencies to gather climate data and predict extreme weather. While this may save him from embarrassment, it will also adversely impact the military and hundreds of businesses that depend on government data. Trump's cuts are not only directed at scientific research, he also wants to see cuts in the disaster response agencies. He recently signed an executive order that, among other things, rescinds flood protections for federally funded buildings and infrastructure. Trump has been working hard to eradicate Obama's legacy of responsible climate actions including those focused on resilience. The logic of investing in climate resilience to defend against flooding is basic common sense. Building on flood plains is one of the reasons we are seeing more flooding. The Obama-era rule that Trump has undone prevents buildings from being constructed in zones that are likely to flood. In a statement Sierra Club Executive Director Michael Brune said slashing government investments in resilience will hurt Americans. "This is climate science denial at its most dangerous, as Trump is putting vulnerable communities, federal employees, and families at risk by throwing out any guarantee that our infrastructure will be safe," Brun said. Trillions of dollars of private and public assets are at risk from climate change including Trump's own assets. It is a savage irony that Trump is trying to deny climate protections to Americans while he has taken action to protect his own business interests. In 2016 Trump applied for a permit to build a sea wall at his oceanfront golf resort in Ireland. Trump's environmental impact report submitted with the permit included reference to sea-level rise as a result of global warming. The Donald does not appear to believe that Americans deserve the same amount of protections as a Trump concern.